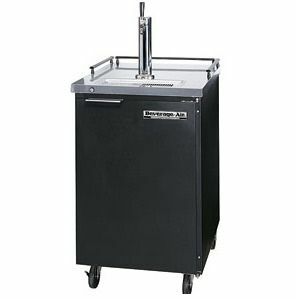 Overall Dimensions: Width: 24" Depth: 29 1/2" Height: 39"
Thanks to its heavy duty forced air refrigeration system and 3" diameter tap with cold air intake, this Beverage Air BM23-B black 24" beer dispenser helps you serve the coldest beer in town. The Beverage Air BM23-B 24" kegerator can hold one half size keg. Its self closing door and 4" casters provide easy mobility and allow for quicker keg changes during busy bar nights.